Recently in one of my classes, I heard someone use the word "whizzbang" in a sentence. Now, I confess, I was convinced that this was simply a word that he made up one day while he was having one of his brainstorms. Nonetheless, I was delighted when I heard this word, and I promptly began inserting this word into every sentence and every situation that I could. My friends were no longer good students, they were whizzbangs. My wife no longer cooked something good, but rather created a whizzbang of a meal (It took a while for her to warm up to this exciting new descriptor). As the "whizzbang" phenomenon continued to spread, I began to wonder whether this might in fact be an actual word. After a quick trip to Dictionary.com, lo and behold, "Whizzbang" is a legitimate semantic unit. The phrase originated in World War I. 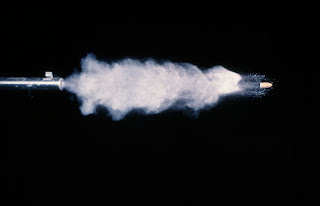 A "Whiz bang" was a bullet that traveled faster than the speed of sound. So, the soldiers would hear the whizzing sound of the incoming bullet before they would hear the bang from the gun being fired. The infamous "whiz bang" was thus greatly feared because "the net result was that defending infantrymen were given virtually no warning of incoming high-velocity artillery fire as they were from enemy howitzers" (via). As with most interesting technical terms, "Whizzbang" began to be applied colloquially. 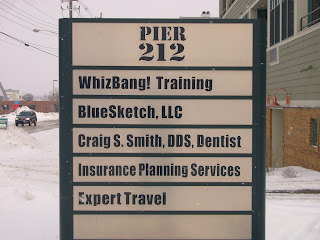 Now, whizzbang could be used as an adjective meaning "top notch" or "first rate." It gradually took on an informal noun form and turned into "whiz", meaning "one who has remarkable skill" (via). So, there you have it. I know you will sleep better tonight for having put this linguistic mystery to rest. Now, to aid in the flourishing of this particular word in your daily life, I've decided to provide a few enlightening examples of first rate usage of the term. As a a substantive (noun functioning as a subject): When my friend Brett becomes a world renowned NT scholar, I will refer to him as "the exegetical whizzbang that I went to class with in yesteryears." As an Adjectival Modifier: When my friend Zach preaches on the fear of God and the love of Christ, the result is a whizzbang of a sermon. As a Predicate Nominative: When it comes to "bringing the cows home for Christ," my friend Billy is a first rate whizzbang. When my friend Michael allegedly offers purgatory points to unsuspecting readers in order to engender theological discussion, the result is "sheer whizzbangery." As you can see, a life lived with "whizzbang" in one's working vocabulary is surely a blight on society a life of syntactical bliss (or rather, a whizzbang existence). Feel free to add any instances of usage I might have missed.